Hanover, 30 April 2013 – The rather low temperatures up until now could give car drivers the impression that they can drive with winter tyres the whole year through. This is a mistake that gives Dr. Andreas Topp, Head of Winter Tire Development at Continental, cause for concern: “At warmer times of the year, winter tyres have a longer braking distance than summer tyres, and handling precision reduces considerably,” he warns. After all, driving tests at summer temperatures have shown that a car with winter tyres, with the brakes applied fully from 100 km/h, took around 6 meters longer to come to a standstill than a car with summer tyres. “This represents more than the length of a car,” says Topp, referring to the residual speed of 37 km/h that the vehicle fitted with winter tyres still displays in an emergency, when the car with summer tyres has already stopped. The precise handling – which is important for avoiding accidents at higher speeds – also reduces considerably with winter tyres in summertime. Fleet-asia.com brings an exclusive feature on a fleet operator and this is meant to get us closer to the players in the industry besides getting an insight into their operation. In this episode, we undertake a one-to-one with Taipanco Sdn Bhd, a leader in the haulage industry particularly, in the Klang Valley. 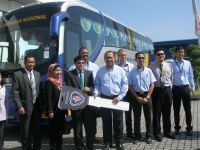 Shah Alam, 25 April 2013 – Scania Malaysia announced the delivery of a new K 410 IB 4×2 intercity coach to Bank Simpanan Nasional (BSN), a statutory body established under Ministry of Finance. 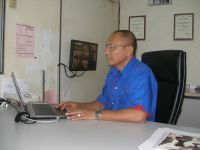 BSN has more than 6,000 employees and 397 branches throughout Malaysia. The K 410 IB sets world class standards for fuel economy, comfort, safety, reliability and uptime. 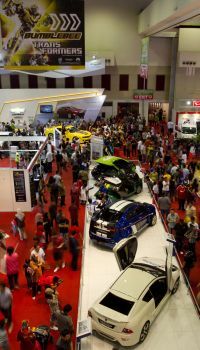 Kuala Lumpur, 23 April 2013 – The Kuala Lumpur International Motor Show 2013 (KLIMS13) is turbo-charging towards the biggest motoring event in the country. 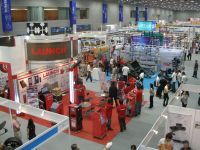 Following the hotly anticipated announcement in January this year by the Malaysian Automotive Association (MAA) that the triennial motor show will take place between 15 and 24 November at the Putra World Trade Centre, the event has garnered overwhelming response from the automotive industry players and the general public. Kuala Lumpur, 22 April 2013 – In conjunction with Earth Day, Edaran Tan Chong Motor Sdn. Bhd. (ETCM) is collaborating with MyTeksi Sdn. Bhd. 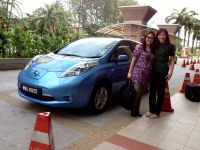 (MyTeksi) to demonstrate their commitment to the environment and sustainable transportation. A fleet of Nissan Leafs’ will be driven around Klang Valley, offering free ‘taxi’ rides to passengers who book their taxis via MyTeksi, Malaysia’s largest on-demand taxi booking network. 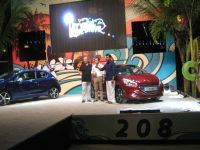 Subang Jaya, 17 April 2013 – The new Peugeot 208 was officially launched at the Sunway Lagoon by the management of Nasim Sdn Bhd and Automobiles Peugeot. Alor Setar, 11 April 2013 – UMW Toyota Motor has unveiled its latest full-fledge comprehensive 3S (sales, service and spare-parts) and Body & Paint Centre in Alor Setar to cater for the increasing number of Toyota vehicles in the Northern Region here today. Petaling Jaya, 11 April 2013 – The new CR-V created a new milestone in Honda Malaysia when close to 3,000 bookings were received in the first month of its launch. This is the highest number of bookings that Honda Malaysia has received for a new car model. Kuala Lumpur, 10 April 2013 – Malaysia’s leading international trade fair for the automotive industry targeting trade visitors from ASEAN, attracted a record number of exhibitors and visitors when it was held 7 – 9 March 2013 at the Kuala Lumpur Convention Centre, Kuala Lumpur, Malaysia. 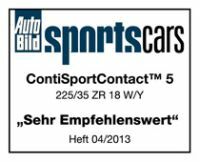 Hanover, 5 April 2013 – ContiSportContact 5 came out on top in the AutoBild sportscars summer tyre test (edition 4/13) and received the coveted “exemplary” title.